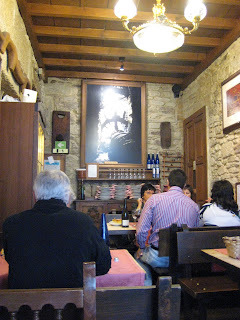 A good place to eat after this inolvidable experience is Bierzo Enxebre where I had an inolvidable meal. The interior is warm Galician farmhouse, wood beams and stone walls where people have inexplicably stuck pennies into the crevices, making bright copper spots throughout the dining room. 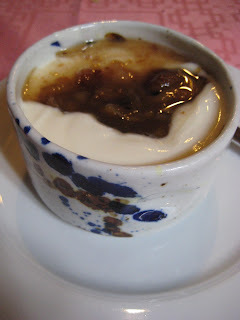 The food is served in traditional Galician dishware, an off-white with abstract splotches of blue and brown. The young lunchtime waiter has a gentle face and Botticelli curls, and he will smile and approve your choices, that is, he approved mine. I couldn’t resist yet another plate of pimientos de Padrón, smaller and even more delicious than the ones Becca and I had in Sevilla. The plate seemed so big but the peppers disappeared so fast. This plate actually did hold a couple of surprises, a couple pleasantly spicy ones. I’d walked in all set to eat the famous pulpo a la gallega, but when I saw with the mother and daughter next to me were eating, I had to ask what it was. They were costelas de porco adobadas (costillas de cerdo adobadas in Spanish or pork ribs rubbed in spices in English) on a bed of French fries. They were insane. They were all crunch, like eating pork rib popcorn. 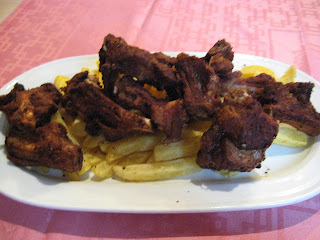 I got a half ración and the platter came overflowing with ribs, but I still ate them all. I couldn’t help it, the way you can’t help eating a tub of popcorn. The wine was just the albariño of the house, but as good as every other albariño I’ve had here. Albariño is the typical white of this region and it’s light and young, not as fizzy as a Portuguese vinho verde but it goes down just as easy. The waiter’s approval really hit a peak when I ordered dessert on top of the enormous meal I’d just eaten. “Please, crema de lemon con castañas.” Castañas are chestnuts and they are all over the market. The lemon custard tasted like lemon and nothing else, just cream and tart and happiness with the sweet, nutty texture of roasted chestnuts. It was “muy bueno,” just like the waiter had said. When I thought no one was watching, I scraped away at the bottom of my cup. I felt like a beached whale, a very happy beached whale. I thanked the God I don’t believe in for my good luck and walked off towards the Museo de Peregrinaciones, the Museum of Pilgrimages. I bought the bread and cheese at the Mercado de Abastos in Santiago de Compostela. The bread is “pan de maiz,” or cornbread, though nothing like the cornbread we know in America, and the cheese is “tetilla” cheese, a mild, tangy, Galician cheese. The pan de maiz is crumbly like soda bread and the cornmeal is definitely mixed in with flour, but it has that characteristic, hearty flavor of “honest bread,” as M.F.K. Fisher would say. I ate it for days, even on the 12-hour bus to Bilbao; neither bread nor cheese went bad just sitting in my hotel room. Even more than the cheese and bread, and the green-skinned freixoa fruit I tried, I liked the way the women at the market smiled at me when I bought it. Maybe I am getting starved for company, but people in Santiago de Compostela are so nice! People started asking me again where I was from and telling me that I spoke Spanish well and smiling such warm, genuine smiles at me. It was almost like I was in Mexico again. I wonder if it means anything that so many Galicians emigrated to Latin America. 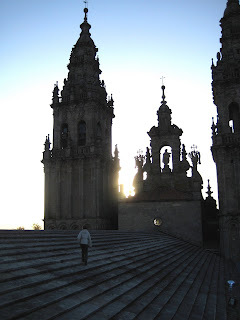 For all my bravado in Salamanca, I arrived in Santiago de Compostela a little sad and pensive. I’d had too much time on the bus to think and I dreaded what I might think about for the next couple of weeks. 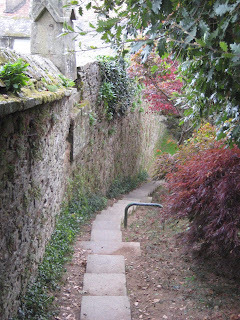 But from the moment I first started walking around the city, I felt happy. At the risk of sounding hokey, I felt at peace. Santiago is famous for being the destination of pilgrims on the Camino de Santiago for over 1000 years, and even though I didn’t walk for three months to get here, it feels right to be in a city where I’m just another solitary traveler looking for something. And the food! I dare Bilbao and San Sebastian to beat the food memories I’ve made here. Galicia is another corner of Spain that isn’t quite Spanish. They speak galego (or “gallego” in Castilian), which looks like Portuguese and sounds like mushy Spanish. So “plaza” becomes “praza,” “iglesia” becomes “egrexia,” and “jardin” becomes “xardin.” It also has a strong Celtic heritage, which means you hear Riverdance music everywhere and junk souvenirs with Celtic symbols on them. Their traditions are peasant traditions of square-shaped men and women fishing and working hard on the land to grow the biggest cabbages I’ve ever seen, judging from what I saw at the Mercado de Abastos. Thus, their food is peasant food, my favorite kind. My first taste of Santiago was a café con leche and a piece of tarta de Santiago, their famous cake made of almonds, at Hostal Girasol’s café, across the street from my own lovely little pensión, the Casa Felisa. Eating anything so deliciously nutty makes me think of my sister and even though I missed her more than ever, I was happy to be eating something that reminded me of her. And then I moved on to lunch. Casa Manolo is tucked into a corner of Praza de Cervantes and is clearly in more guidebooks than Lonely Planet, as there were plenty of pilgrims in walking sandals and Gore-tex clothing eating there. But just because a place is popular with pilgrims is no reason to sneer at it. For 8 euros, I was given my choice of an appetizer, an entrée, dessert, and bread. Wine was extra, but a “copa” for a 1,80 euros turned out to be a carafe with a good two glasses worth of the light, bright local white, albariño, that was a true pleasure to drink. 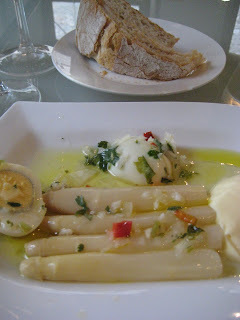 I’d been curious about white asparagus ever since I saw it in jars at gourmet shops in Madrid, but the white asparagus I had with olive oil, mayonnaise, and boiled eggs was nothing particularly exciting. 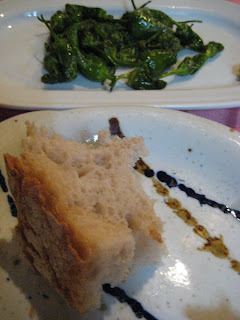 The bread, though, was the best bread I’d had in Spain. It was my favorite kind of bread, a good brown, floury crust with a slightly tangy, tender crumb, not as tough of a levain but as flavorful. It didn’t need any butter or olive oil, it held up so well on its own. 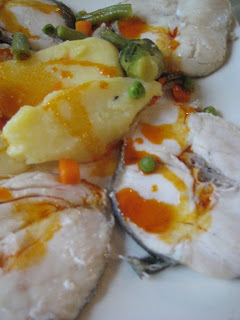 I had a typical Galician dish for my entrée, merluza or hake cooked with paprika and olive oil. The boiled peas and carrots were very peasant in being tasteless, but I was so impressed by how good a white, firm fish could be. It was simple, very clean, and so so good. Even the boiled potatoes were good.